The 2017 IMA Prize in Mathematics and its Applications has been awarded to Jianfeng Lu, an associate professor in the Department of Mathematics at Duke University, with secondary appointments in the departments of chemistry and physics. Lu received this recognition for his many contributions in applied analysis, computational mathematics, and applied probability, in particular for problems from physics, chemistry, and material sciences. The unique strength of his research is to combine advanced mathematical analysis and algorithmic tools with a deep understanding of problems from science and engineering. “More specifically, I am interested in understanding essential mathematical tools and ideas behind the approximation and numerical methods developed to deal with complex chemical and materials systems modeled at physical levels ranging from quantum mechanics to atomistic models to continuum mechanics,” Lu explained. Going back and forth between mathematics and frontiers in other areas has turned out to be quite fruitful for him. Some of Lu’s major research achievements include ground-breaking contributions to electronic structure models, multiscale methods, rare events, and quantum molecular dynamics. 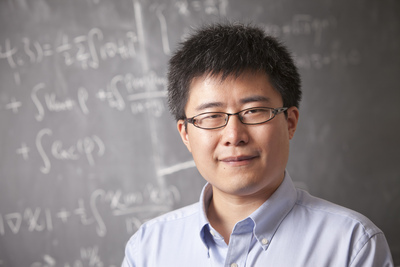 His most recent contribution on the mathematical understanding of surface hopping algorithms has generated enormous excitement in the quantum chemistry community. Lu credits his Ph.D. advisor, Weinan E (Princeton University) for teaching him to always look for challenges outside the existing boundaries of applied mathematics and to never be afraid of learning and working in unfamiliar territories. His Duke colleagues outside the math department, including Thomas Barthel (physics), Volker Blum (materials science), David Dunson (statistics), Jungsang Kim (electrical engineering), Henry Pfister (electrical engineering), and Weitao Yang (chemistry), are always bringing him new challenges and opportunities to research. Since receiving his Ph.D. eight years ago, Lu’s list of about 100 peer-reviewed publications demonstrates his broad expertise in terms of models, computational tools, and rigorous techniques. Going forward, Lu has been currently focusing on numerical algorithms for high dimensional problems (either classical or quantum) arising from these areas by drawing and further developing tools from other areas of applied mathematics. “I hope this research direction will lead to fruitful interactions and cross-fertilization between various disciplines,” he said.